Scholars in still more fields of academic science have realized that no matter what phenomenon here on Earth one are studying, it is worth while to perform a comparative analysis of the same conditions in our favorite parallel universe, the world of the Ducks. 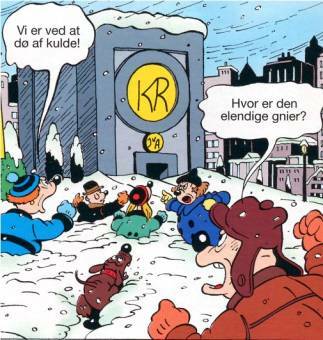 And since a lot of allegedly intelligent people from all over the world in the preceding weeks have met here in Copenhagen to discuss climatic changes on Earth and what to do about it, what could be more natural than to ask ourselves: Does the climate change in Duckburg? Well, apparently quite a lot could be more natural, since this is only the second attempt that I am aware of trying to answer such a question. Without doubt, there is more than one scientific approach that one may take in a study of this kind. Contrary to my German colleague and predecessor in Donaldistic climatic-change studies, MdD Peter Jacobsen, I have chosen a comparative-chronological-statistical cross-section analysis, which is based on a complete register of records of the weather as published in Donaldistic duckumentaries in three randomly chosen years, in total covering a period of 55 years: 1950, 1972 and 2005. As climatologists traditionally set the minimum studied period to 30 years, I therefore consider the time length of the analysis more than adequate. 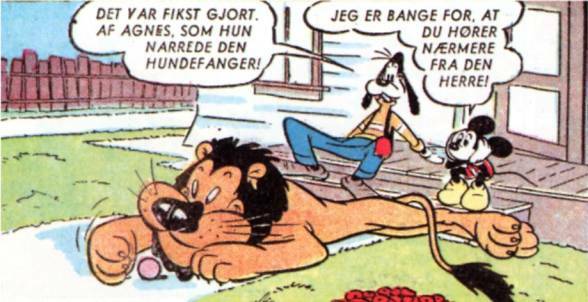 In respect of the present audience and place of conference, I have decided to make use of the chronology in the Southnordic source material, meaning that the observations are based on the duckumentaries in all the issues of Danish Anders And & Co. from 1950, 1972 and 2005. 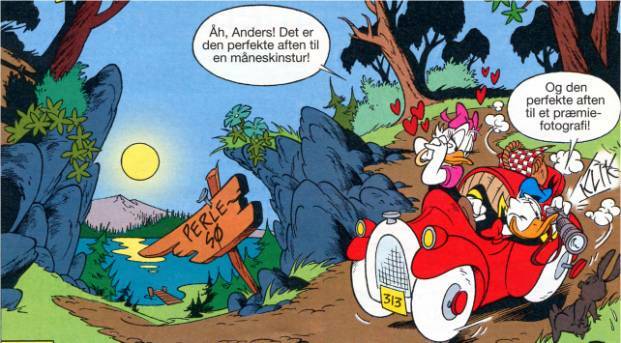 ..or taking a romantic moonlight drive to Lake Pearl with your favorite bird. Most days, the only thing to worry about from above for the Duckburgians is non-meteorological nuisances - which can, of course, also be annoying enough. ..or even just getting out of their own houses. 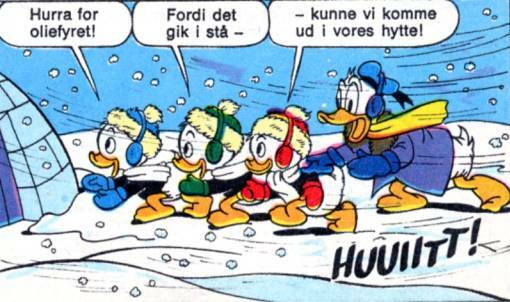 Smart Duckburgians therefore soon realize that shuffling snow is a job better left for the younger generation. 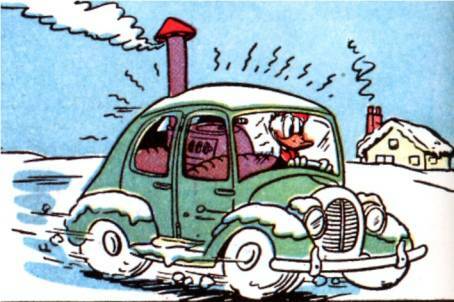 ..an even for Duckburg extraordinarily cold winter soon kicked in. 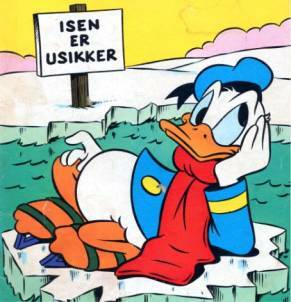 January in Duckburg can be cold. Very cold indeed! The freezing conditions drive ingenious citizens to creative solutions on how to keep warm. In 1972, Mr. Duck for a time even thought that the cold had led to a demographical migration of Eskimos into his front garden. The severe January cold is usually accompanied by quite a lot of snow. In 2005, two meters of snow fell in just one night! ..and early February sun, causing deadly effects to the city’s population of snowmen. In 1972, however, it was not until March that the ice started to break up and give way to spring - which still came as a surprise to some Duckburgians, although properly warned by the authorities. ..but finally, by the middle of the month, thaw was setting in and spring could take its long awaited beginning. ..while bird lovers remember an unexpected cold period in October that same year with both snowfall and frost. ..whereas the snowfall of popcorn in April 2005 apparently was not meteorologically based - although still very popular with the kids. 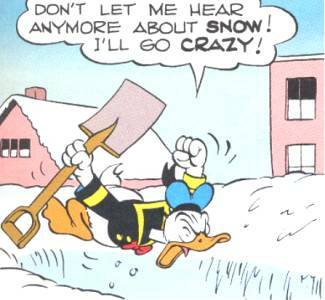 So, what do all these duckumented weather observations have to say about any possible overall change in the Duckburg climate? Well, as already mentioned, the duration of winter seems to have expanded during the studied period from almost 2 months (early December-late January) in 1950 to more than 3 months (early December-early March) in 1972 and 3½ months (early December-mid March) in 2005. 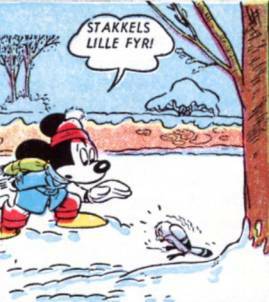 Thus, Duckburg winters are getting longer. Apparently, though, they are not getting significantly harsher, which is a rather good thing as they right from the beginning were quite hard. Measuring the duration from beginning till end of winter does, however, not say it all. 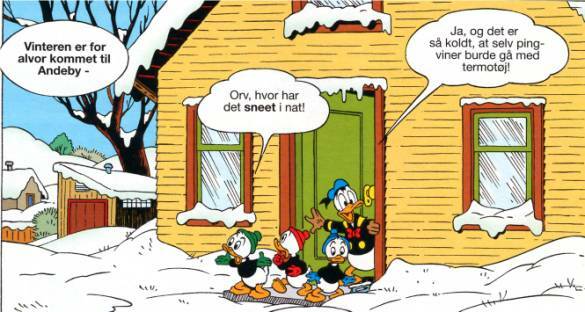 If we count the number of actual days of frost and snow, or rather, compare the number of winter duckumentaries with the total number of duckumentaries in Danish Anders And & Co. (AA) in each of the three years, we can note some interesting differences. In 1950, 7.9% of the published duckumentaries showed frost and/or snow, while this percentage had grown to 10.7% in 1972. Whereas this growth corresponds well with the extended winter period (from 2 to more than 3 months), the relative number of winter duckumentaries in AA of 2005 had - surprisingly enough - fallen to 7.4%. Although the winter period of 2005 was longer than for the former years, the number of actual days of winter was on the same level as in 1950. 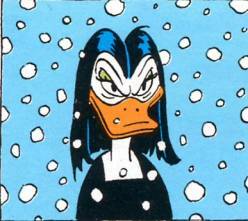 Or to put it differently, Duckburg weather during winter and early spring apparently has become less consistent. 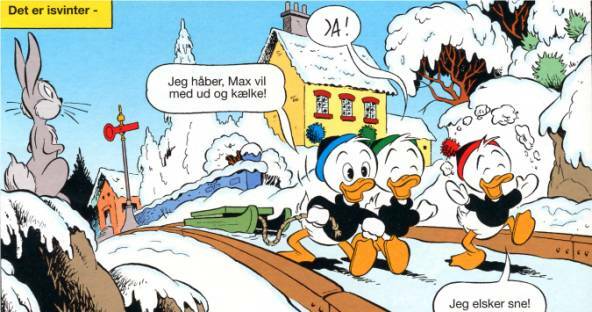 Most of the precipitation in Duckburg falls during winter as snow. 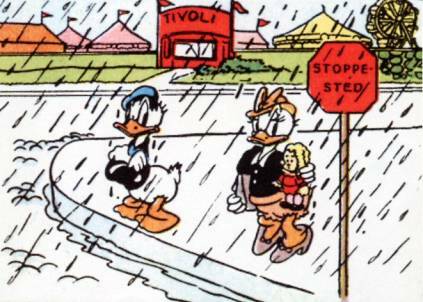 However, rainy days are also an only too well-known phenomenon in Duckburg. ..or the annual municipal summer party. 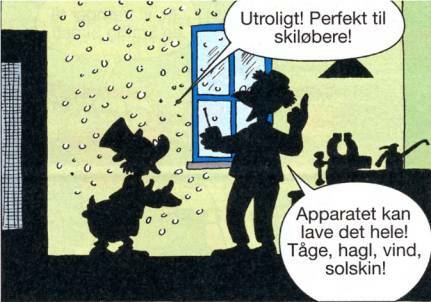 After two weeks of solid rain in July 2005, even an amusement-ignorant umbrella manufacturer such as Scrooge McDuck had had enough. ..and out in the Duckburgian countryside, rain is a highly appreciated type of weather among most farm people. ..turned out to be a false meteorological alarm caused by a playful elephant. 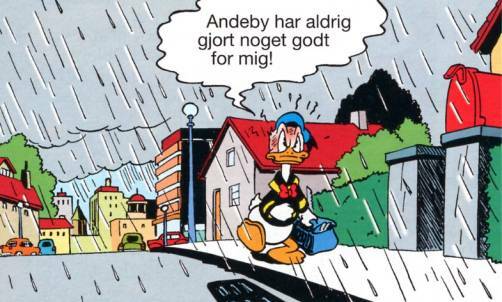 So, excluding the November shower of 1950 from the statistics, what do the rainy records of Duckburg anno 1950, 1972 and 2005 say in a climatological context? 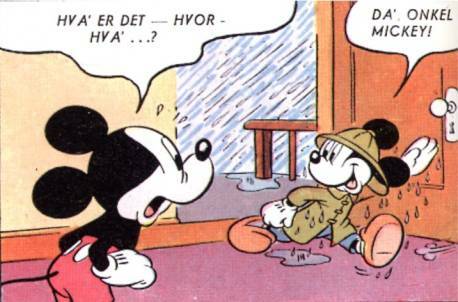 If we start with the number of duckumented reports on rain, no change at all can be found for the first subperiod from 1950 to 1972: it was raining in 3.2% of the stories from AA 1950 and in 3.1% in the stories from AA 1972; the relative difference of 0.1% is best explained with statistical uncertainty. In the second subperiod from 1972 to 2005, however, the number of rainy days rose significantly from 3.1% to 5.5%. No wonder that even old Scrooge McDuck began to find it tedious in July 2005. Nothing is so bad that it cannot get worse. This is a truth especially evident in the life of Donald Duck. In the case of rainfall, a common meteorological turn for the worse around the home of the Ducks is storms with both rain and strong wind. In Stella anatium, storms with strong winds are especially frequent at sea. Often the Ducks can hardly set sail before they are caught in a storm. 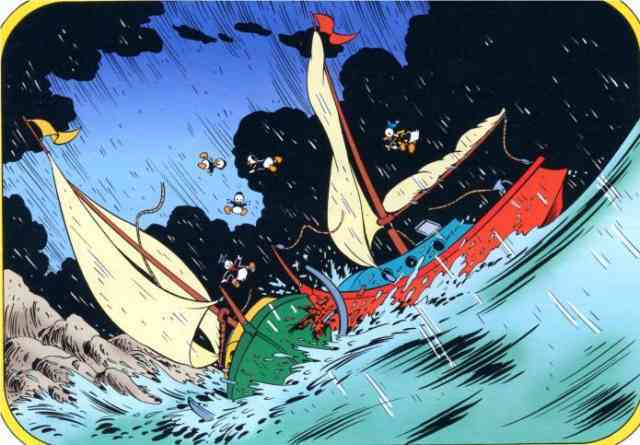 Such maritime storms are not just a phenomenon at far sea, as they often occur quite near the shores of Duckburg as well. ..although “strong wind” is, of course, a matter of relative opinion. 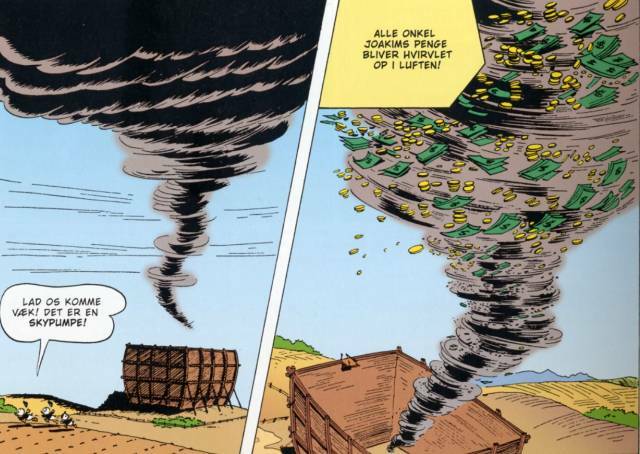 In the presently studied years of Duckburg weather, no major hurricanes were reported, but a minor whirlwind did occur in June 2005 on the city’s golf court - assisting Mr. Duck to a rare hole-in-one, by the way. 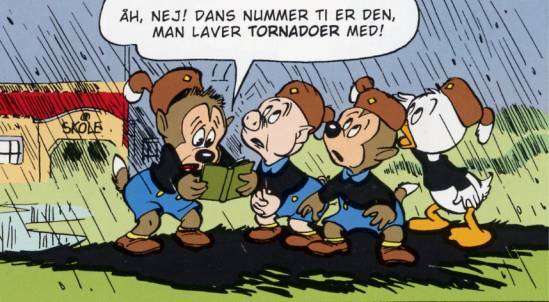 Has the wind changed, so to speak, according to our Duckburg weather reports from 1950 over 1972 to 2005? It certainly has! Whereas significant wind only was reported in 0.9% of the duckumentaries of AA 1950, the number had grown significantly to 2.2% in AA 1972 and further to 2.7% in AA 2005. Not only have the Duckburgians experienced still more days of wind in the period, the storms also seem to get stronger. 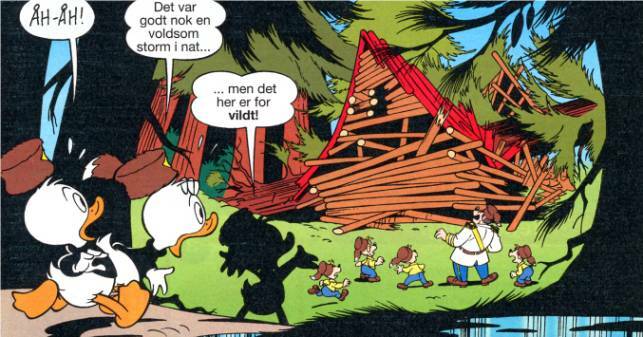 And although Mr. Duck’s abovementioned whirlwind-assisted hole-in-one shows that one should be careful not to automatically label all strong winds as a thing of the bad, the stormy weather of Duckburg certainly has a lot of damages on its conscience. So, the increasing amount of strong wind can cause problems for the Ducks, but too little wind can also have its negative effects. 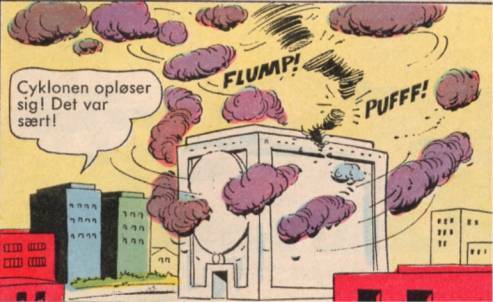 In 1972, Duckburg was recurrently pestered with a no-wind-problem known to many a great city: smog and fog! ..causing several nuisances for the sorely tried citizens - such as foolish questions from infuriating children. 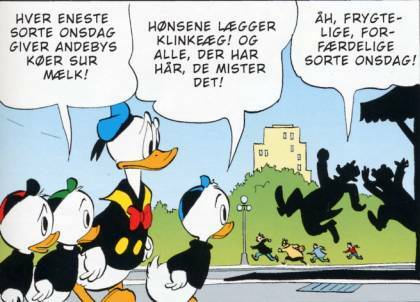 In the summer of 1972, fog returned to Duckburg, apparently in a density even worse than its predecessor in March - if the tabloid headline does not just reveal that the “living memory” of the Duckburgians is extremely short-lived. While the first misty incident of 1972 explicitly was caused by air pollution, probably created by the Duckburgians themselves, nothing of the aerial content is mentioned for the two latter, but in both cases they are officially referred to as fog - thus indicating the actual meteorological phenomenon of low-hanging clouds of humid air. Neither smog nor fog is reported in the duckumentaries of AA 1950 or AA 2005, and, thus, it appears to be a phenomenon mainly related to the early 1970s - perhaps the particular year of 1972 only. 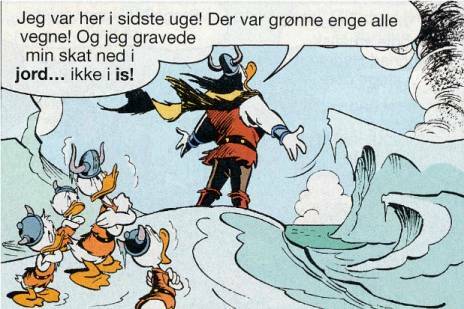 In conclusion, my climatological search for systematical and statistical changes in the weather of Duckburg in a period over 55 years, as presented in three randomly chosen cross-sections of Danish Anders And & Co. (1950, 1972 and 2005), clearly shows that Duckburg climate has changed and probably still is changing. The winters are lasting longer (main shift from 1950 to 1972), but are also becoming less consistent in terms of snow and frost (shift from 1972 to 2005). It rains more than it used to and strong winds occur still more often - in both cases, once again, with a main shift from 1950 to 1972, but with a continued increase from 1972 to 2005. A severe increase of smog and fog problems in 1972 was apparently blown away in 2005. The observant Duckburgians have, of course, noticed the changes and begun asking themselves what the reason could be. 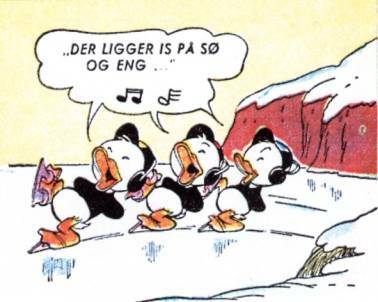 In the final part of my report, I will present six possible causes for the observed climate changes in Duckburg, which I can find basis for in the Donaldistic sources. On Planet Earth, weather is constantly changing. Hardly two consecutive days are alike, even less two consecutive years. Climatologists do, however, not deal with day-to-day or year-to-year weather changes, they look at systematic changes over longer time-spans, going from around 25 years to millenniums. In the 4.6 billion yearlong history of Earth, the planet has experienced a number of significant climate changes, including a recent series of ice ages, of which the (until now) last one ended about 10,000 years ago. Even within the last 1,000 years, the average temperature has gone up and down several times, for instance leading to the so-called “Little Ice Age” in Europe with three temperature minima c. 1650, 1770 and 1850, separated by intervals of slight warming. Maybe the Planet of Ducks, Stella anatium, is going through constant and overall climate changes as well? 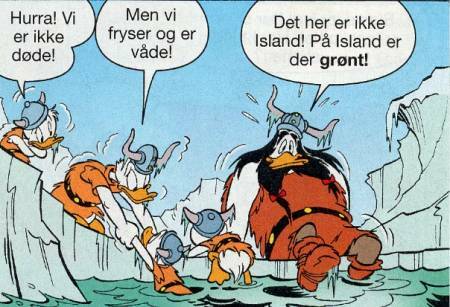 This is certainly indicated by a Viking Duck, who after approximately 1,000 years was defrosted in 2007 only to find that his native home of Iceland in the meantime had changed drastically from a country of green meadows to a frosty landscape of glaciers. And, thus, from a mild temperate climate to a polar one. 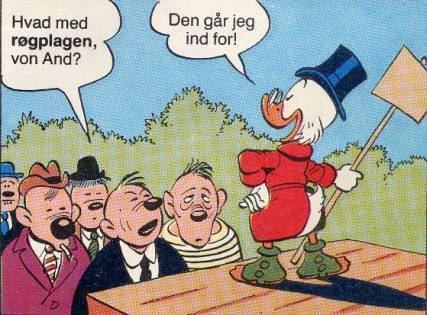 On a shorter climatic term, old people of present-day Duckburg claim a change of temperatures going the other way, so that the winters of our days are nothing compared to the ones of the late nineteenth century. But then again, as stated short ago from this very pulpit by Dr. Gjøgsig, such senior-lay-climatological statements need to be taken with a grain of (melting) salt. 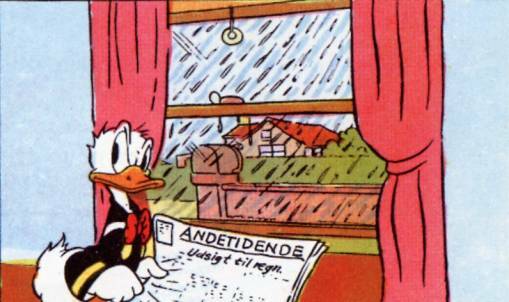 Thus, the observed weather changes in Duckburg from 1950 over 1972 to 2005 may just reflect yet another natural change in Stella anatium’s climate. But, as I will show in the following, other potential explanations are certainly also at hand. A widespread theory among climatologists and environmentalists on our planet is that Earth’s climate is presently changing due to ‘global warming’ caused by man-made pollution of the atmosphere, first and foremost through emission of carbon dioxide (CO2). The idea is that CO2, especially created from burning fuels, when emitted to air will rise into the atmosphere and here increase the existing quantity of the so-called greenhouse gasses, which works as a kind of isolation layer, preventing the planet from cooling off too much. As the isolation layer gets thicker, less warmth slips through into space, instead, it is reflected back to Earth and makes the surface temperature rise. Apparently, such a man-made global warming does not only rise the average temperatures, shortening the winters and creating more droughts, it also causes a wide range of climatic disturbances, such as melting the polar and alpine ice masses, which increases the sea level and changes the ocean temperatures and stream patterns, which in the end is leading to more storms. Today, I shall refrain completely from entering the debate on whether or not this theory is plausible for Earth, leaving that for the other conference nearby. 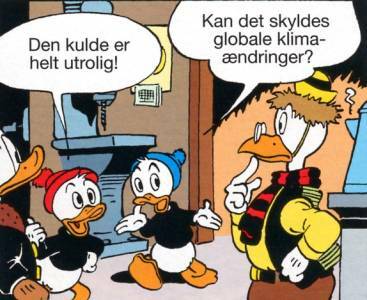 Here, the interesting question is: could man-made emission of CO2, causing a global warming on Stella anatium, be the explanation for the observed climate changes in Duckburg? A statement like the one quoted below by Scrooge McDuck, Duck Planet’s industrial magnate no. 1, certainly does not speak against it. Indeed, this explanation is strongly supported by my esteemed German colleague, MdD Peter Jacobsen, who earlier this year at the 31st congress of D.O.N.A.L.D. in Bielefeld presented the first study of climate changes in Stella anatium. 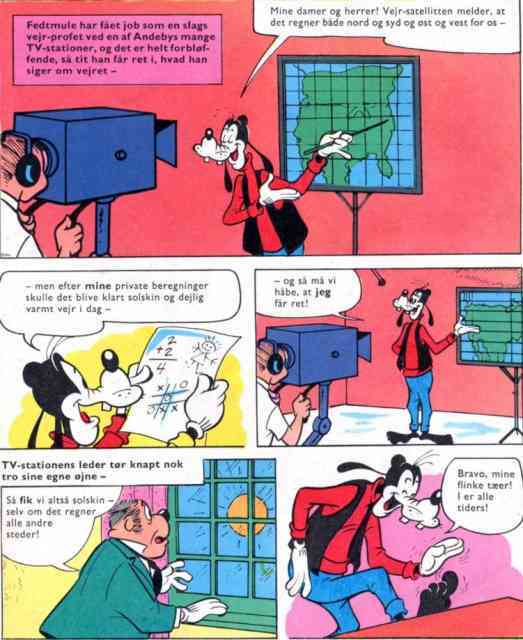 Based on Barksistic source material only, and refraining from making use of any editorial chronology of the duckumentaries, Herr Jacobsen managed to identify a number of interesting observations of possible climatological importance. From these he concluded that Stella anatium too(?) is experiencing global warming, and that this climatic change even has caused significant alterations in the Ducks’ physiology! Although I respect and recognize MdD Jacobsen’s method and keen eye for climatological observations, I have to say that I disagree with his chief interpretations and overall conclusion. 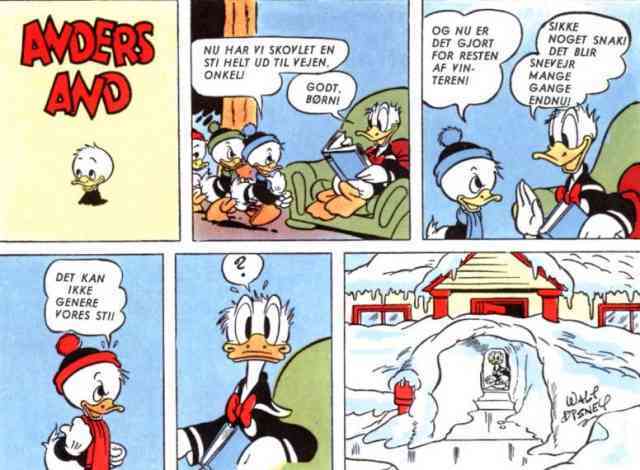 His commendable clever and innovative idea of using beak-length-measurements to identify long-term changes in Duckburg temperature (an at-first-hand perhaps not completely obvious correlation, which is however convincingly argued for by the scholar), not only brings him into conflict with his own dismissal of chronological use of the sources, it also ends up supporting the exact opposite conclusion: that indeed the climate of the Ducks appears to have grown colder! ..and then presses the waste material into small and extremely solid bricks. 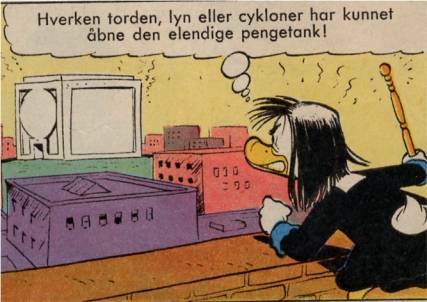 At least after 1972, it seems as if Duckburg has found an effective solution to its pollution - and, thus, has put a stop to any potential man-made global warming of Stella anatium. The following four explanation theories have, as far as I know, not been put forward as possible reasons for climatic changes on Earth. Not yet, at least. Nevertheless, they all appear quite plausible for Stella anatium in general and Duckburg in particular. The first of these is technologically based. 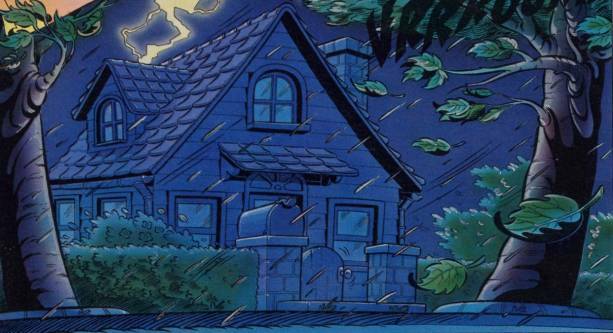 In Duckburg, weather is not just something that you have to take as it comes. Duckburgians have the technological knowhow to change the weather themselves! 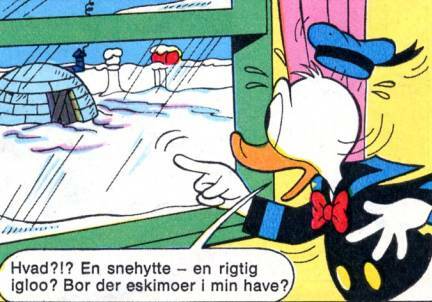 Weather-making technology is duckumented on several occasions in Donaldistic source material right from its earliest days. 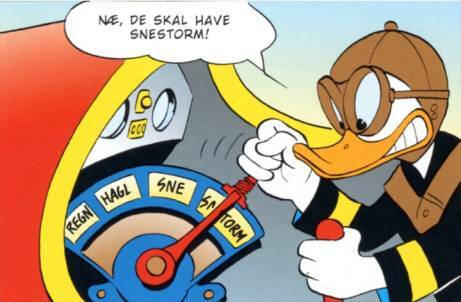 Interestingly enough, the weather-types to chose from on Mr. Duck’s airborne weather machine in the exhibit above are quite similar to those kinds of weather, which we have seen have increased significantly in frequency over Duckburg since 1950! The ability to change the weather can be achieved in Duckburg through simple purchase. 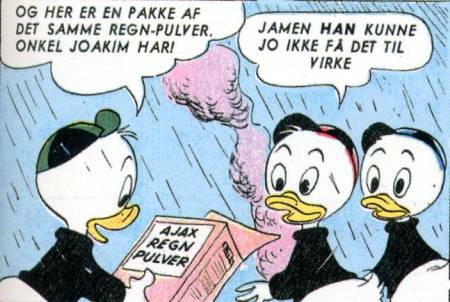 Surely, Donald Duck has not constructed the weather-making machine on his airplane himself, and the famous, all-embracing company AJAX (known as ACME on the American market) even seems to sell rain powder from retail. 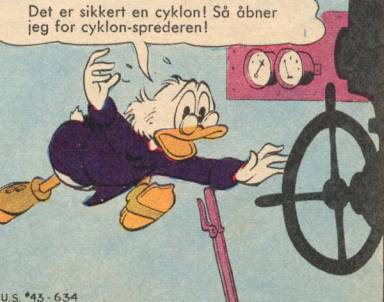 When it comes to advanced technology in Duckburg, the logical source to look for is of course Gyro Gearloose, and while the inventive brains behind the two technologies shown above remain unknown to us, Mr. Gearloose on several occasions has proved his spearhead position in this technology too. As Mr. 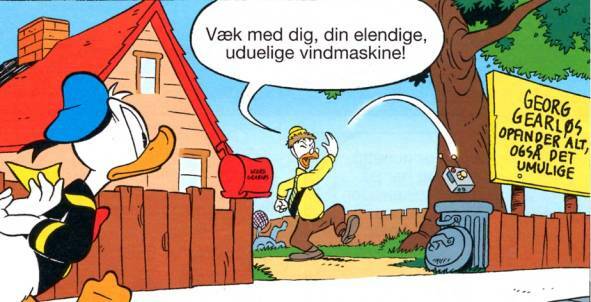 Duck would discover, the wind machine was far from completely useless. In fact, the technology created a fresh wind in no time. Its minor malfunction, which had led to its scrapping, was that it could not be turned down or off. 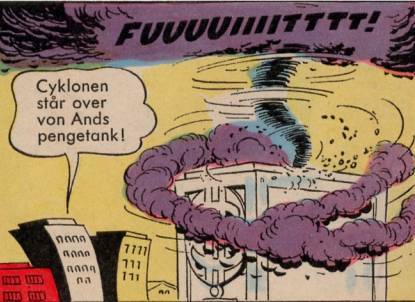 ..turned out to be caused by an ice machine developed by a certain Mr. Phlødesen. Who in his ingenuity even had managed to bring down temperature to sensational -275 °C, that is 2 degrees below absolute zero! Unfortunately, he forgot to put on his sweater first. 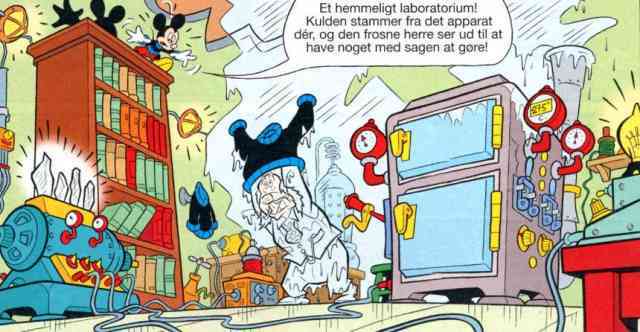 No matter whose brains are behind the various types of weather-making technology in Duckburg, the machines tend to have one common flaw: they end up creating meteorological catastrophes! 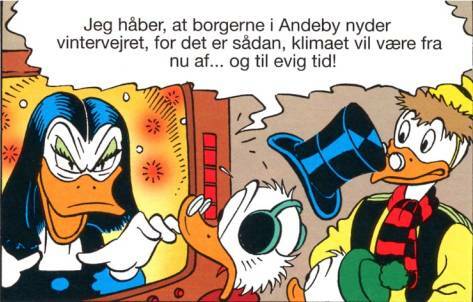 Apparently, the Duckburgians always manage to get through the disasters and clean up their meteorological mess before the beginning of the next duckumentary, but surely it cannot be ruled out that such continual catastrophic messing with Duckburg’s climate eventually could cause permanent effects - and, thus, change the climate for good. 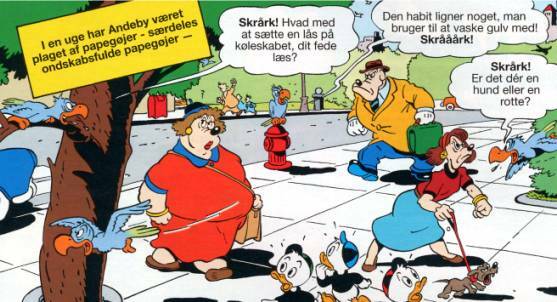 The heading for my fourth suggestion will probably provoke some in the audience, especially those who claim that religion does not exist in Duckburg. That discussion is better left for a different forum, but I do think that ‘religious rituals’ is the most suited label for what we are to look at here. Indeed, one of our school’s great masters, Dr. don. ext. hon. 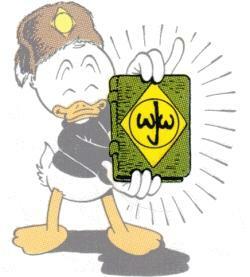 Jon Gisle, in his classical work Donaldismen from 1973 suggested that the closest thing we come to divine presence in Duckburg is manifested in the Junior Woodchucks, first and foremost the Junior Woodchucks’ Guidebook, a supernatural scripture, which in spite of its handy size contains all knowledge anyone ever had in Stella anatium - to judge from pictures of its use especially concentrated to the middle section of the book. And sure enough, this marvelous piece of writing even contains a chapter on how to make weather! The weather-producing process promulgated by the Guidebook involves no mechanical or chemical technology. Instead, the book gives a detailed description of a rhythmic ritual, which when performed with elegance, enthusiasm and elevated endurance eventually will generate the weather type invoked. For instance, dance no. 9 - a foxtrot - will bring about rain, not to be confused with dance no. 10, which is the one used for making tornadoes. The divine dancing apparently works. Quite effectively, even! And while the senior Junior Woodchucks command continued discipline during the execution of the holy liturgy, the junior Junior Woodchucks are evidently and understandably frightened by the formidable forces from above, which they have helped release. It has to be admitted that the present duckumentary does leave some uncertainty to whether the generated storm in question is indeed created by the Junior Woodchucks or not - as it often is with religious manifestations. 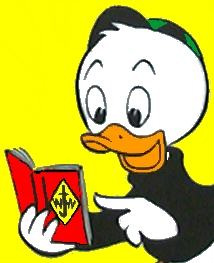 But surely, all serious Donaldistic scholars will agree with me that it would tend heresy for us to question the validity of information brought to us through the Junior Woodchucks’ Guidebook! According to the good book, it is possible for the Ducks - at least those ordained in the ranks of the Junior Woodchucks - to make changes in the weather through the performance of rhythmic rituals. And if the Book says so, who among us is to question it? The Junior Woodchucks are not alone in being able to invoke powerful meteorological forces in Stella anatium without using material technology. Someone even surpasses them by far when it comes to the magnitude of the generated phenomena. 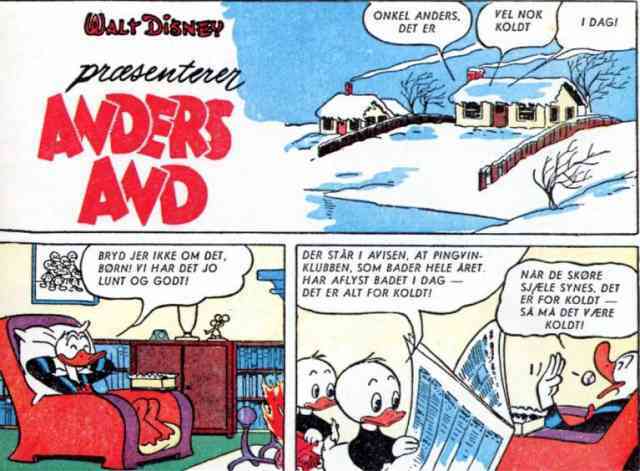 In March 2005, Danish Anders And & Co. in simultaneous broadcast with Duckburg television could report about nothing less than the beginning of a new ice age - over just one night! 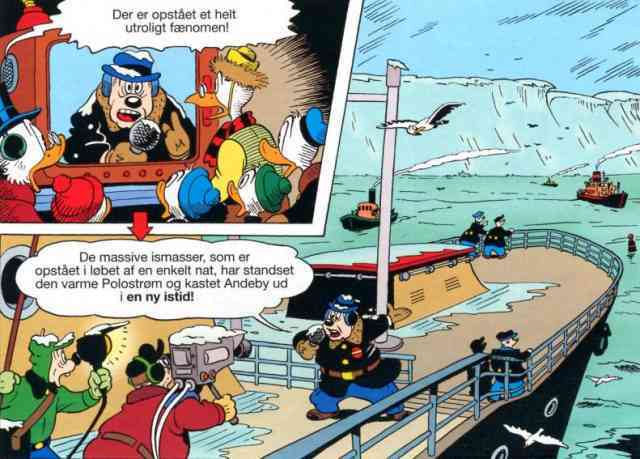 An enormous mass of ice had suddenly come out of nowhere and blocked the Polo Stream, a warm ocean current of essential importance to Duckburg climate. 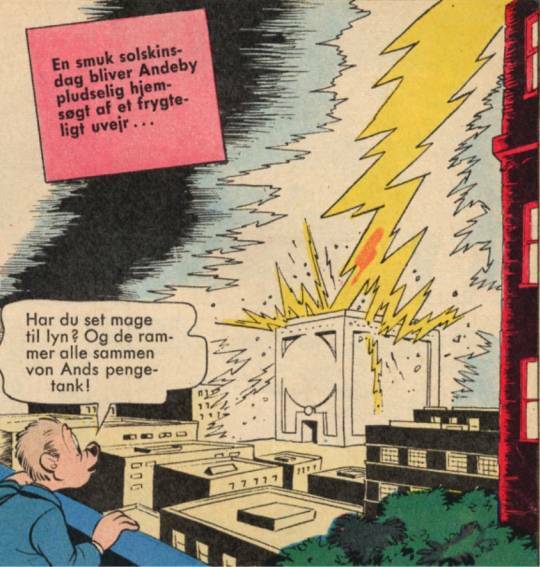 And what turned out to be even more shocking: this colossal climatic catastrophe was caused by witchcraft! ..including the redirection of meteors, but to draw down an entire ice age on Duckburg is probably her chief climatic accomplishment to date. Exactly how she pulls it off is still a mystery to science, but usually she finds the recipes for her powerful witchcraft from ancient books on black magic, indicating that such climate-changing dark forces have been at play before in Stella anatium. Signorina de Spell’s reason for all these destructive efforts is, of course, her everlasting wish to get hands on Scrooge McDuck’s lucky dime in order to become the most powerful witch ever. After seeing what she is capable of without the dime, we can only hope for the Anatide civilization that her dreams will be left cold. ..not to mention more every-day meteorological phenomena such as comets and meteors. 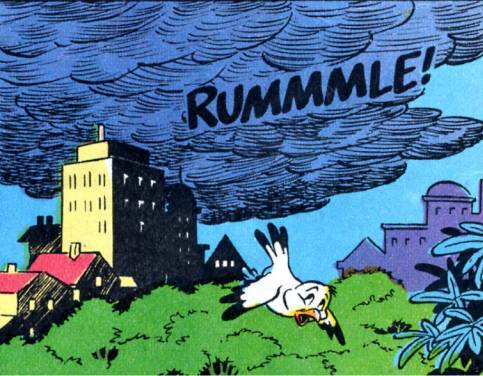 Admittedly, several of these meteorological encounters can rightfully be explained by my Duckburg climate-change-cause suggestion no. 5, i.e. witchcraft, but several similar incidents in other duckumentaries do not appear to have any magical foundation. Around the money bin exists seemingly a microclimate of its own. How can a building cause such a dramatic effect on the weather? Well, for one, the money bin is a very cold place, as Mr. McDuck is exceptionally economical in regard of in-house warming. ..just as the annual airing of the money bin, on what was (un)popularly known as “Black Wednesday”, for a number of years caused severe health problems for the entire city. I would, however, also like to point to the enormous monetary masses within the money bin as a possible part of the explanation. We are, as you know, not just dealing with any old piggy bank or deposit box. Could it be that such an incomprehensively mass of money - 3 cubic acres worth of high-value metal! - is having a physical impact on the meteorological and - as time passes and the mass grows - climatic conditions of Duckburg? Professor J.G.G. 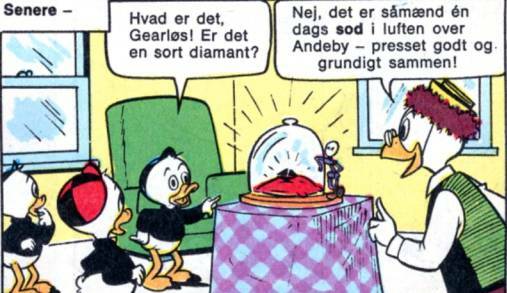 Jakobsen of this Academy has already at an earlier occasion suggested a possible temporal-physical effect of the McDuck liquidity on time itself in Duckburg. 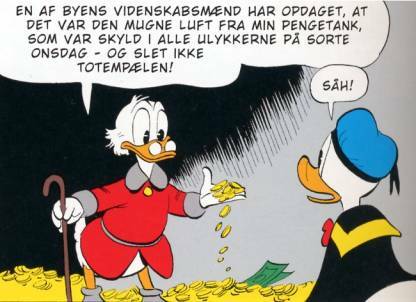 If this indeed is the case, that Scrooge McDuck’s increasing accumulation of money has a destabilizing impact on the climatic system around Duckburg, causing longer winters and more storms, a revelation of this to the Duckburgians might even end up leading to social uprisings. 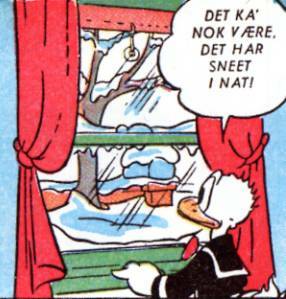 In conclusion, my systematical and statistical survey of meteorological data from Duckburg collected over a time span of 55 years shows evidence of a climatic change towards longer winters, and more rain and wind during the rest of the year. I have presented six possible causes for this change: 1. Natural causes; 2. Man-made pollution; 3. Weather-making technology; 4. Religious rituals; 5. Witchcraft; and 6. McDuck’s money bin. At this point, I will refrain from pointing to any of the suggested causes in preference to the others, just as it very well may be that two or more of them are affecting the climate jointly. 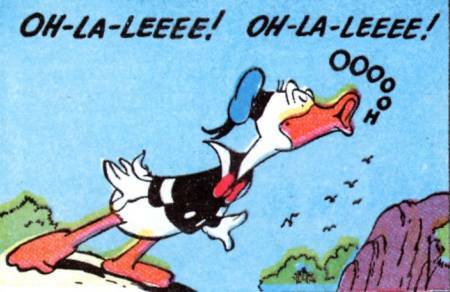 The answer, my friends, if you will excuse me the phrase, is blowing in the Duckburg wind. 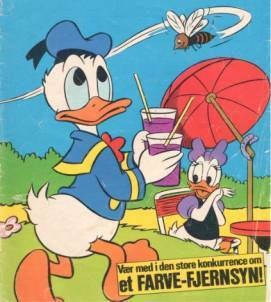 Perhaps no one but the Junior Woodchucks’ Guidebook will ever know the true reason for Duckburg’s changing climate - except maybe for Magica de Spell and/or Goofy’s weather-wise toes. Jacobsen 2009; not to be confused with Professor Jakobsen of this Academy. Jakobsen 2006; not to be confused with MdD Jacobsen of D.O.N.A.L.D. Shortly summarized: evolutionally, animal species on Earth seem to have adapted physiologically to the temperatures of their environment. This is especially evident for the extremities - such as ears, snouts, legs and tails - which tend to be shorter and kept closer to the body on species in cold climates compared to their counterparts in warmer climates, due to their respective needs of keeping or getting rid off body warmth. Jacobsen, like Jon Gisle (1973) before him, noted that the Ducks’ beak length (ger. Schnabellänge) steadily has decreased since Early Donaldism. As admitted by Jacobsen, this should point to an Anatide adaption to colder conditions, which he, however, tried to get about in a not so convincing manner with an additional, counter-interpretive explanation. 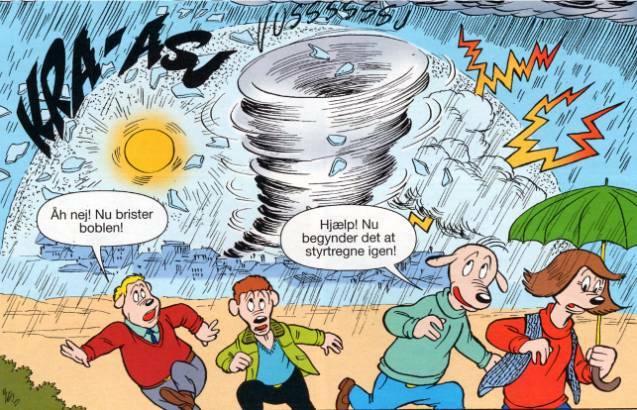 Gjøgsig, Jeronimus (2009): Wind and Weather in Duckburg - Climate observations from Stella anatium, Sydnordisk Akademi for Donaldisme. Jacobsen, Peter (2009): 'Eine unbequeme Wahrheit - Die globale Erwärmung und die Enträtselung der Entenhausener Chronologie', in: Der Donaldist vol. 135, pp. 12-29. Jakobsen, J.G.G. 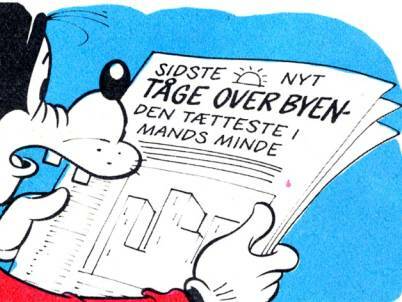 (2003): Ændernes egen tidsopfattelse i neoklassisk vicarianisme, Sydnordisk Akademi for Donaldisme.